The Seahawks reportedly have traded Max Unger and the No. 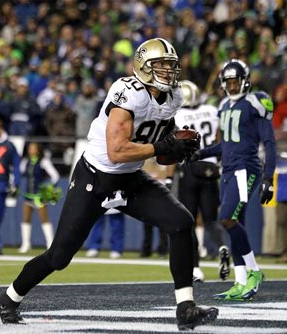 31 pick in the draft to the New Orleans Saints for tight end Jimmy Graham and a fourth-round pick. The Hawks and Saints reportedly have been talking about the trade since Sunday. Seattle had reportedly lost a bidding war for Denver tight end Julius Thomas. Graham is just 28 and could be a great solution to one of the Seahawks’ chief problems. Last year, the 6-foot-7 target caught 85 passes for 889 yards and 10 touchdowns. A third-round pick in 2010, Graham has 386 catches for 4,752 yards and 51 touchdowns in 78 games. It’s the second time in three years the Seahawks have traded their first-round pick for a veteran playmaker on offense, and they have to hope this deal works out much better than their blockbuster for Percy Harvin in 2013. Graham reportedly is due a $5 million roster bonus on Thursday, and the Saints are in rough salary cap shape — which explains their willingness to do the deal. Graham is working on the second year of a four-year, $40 million contract which calls for salaries of $2.9 million this year, $8.9 million in 2016 and $7.9 million in 2017. He would be an $8 million hit against Seattle’s salary cap this year, if his contract stood. The Hawks could always tweak his deal a bit though to make it a bit more cap-friendly. Unger was to make $4.5 million in 2015 and will count an extra $1.1 million in remaining bonus proration, so that is a net additional hit of $4.6 million for Seattle. Unger, 29 in April, has missed 13 games over the past two seasons with various injuries. He was signed through 2016, with a $4.25 million salary next year. With Unger leaving, Patrick Lewis is the top remaining center. Lewis started four games at center last season, displacing Lemuel Jeanpierre as the No. 2 guy late in the year. The Hawks still could re-sign Jeanpierre or Steve Schilling for depth. This is John Schneider’s 32nd trade in his five years as Seattle general manager, and 24 of those have involved veteran players. The deal also plays into Schneider’s preferred MO of picking up players who are not unrestricted free agents. With news that linebacker Malcolm Smith is signing with Oakland — joining Byron Maxwell and James Carpenter as departing UFAs, the Hawks are sitting at plus-three in the comp-pick formula for next year already. The deal leaves the Hawks with these expected draft picks: 2, 3, 4, 4, 4, 5, 5, 5, 6, 6, 7.